Welcome to the Koala Outback. This web page has been designed to provide you with information on the Koalas at the Fort Worth Zoo. I hope this page encourages you to visit these Koalas. Enjoy your stay! Status: Verge of 'rare and vulnerable"
The Koala breeds 1 to 2 times per year. The gestation period is about 35 days and the usual litter size is 1 joey, but twins have been reported. At birth the Koala weighs 5.7 grams and is about the size of a thumbnail. The Koalas are "pouched" mammals. 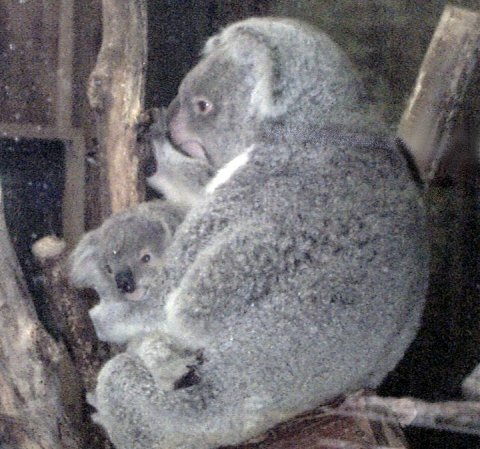 At birth the young find their way to the pouch and remain there for up to 7 months. The Koala reaches sexual maturity at the age 4. At maturity the Koalas are about 29.5 inches long and weigh about 20 pounds. Koalas can survive as long as 20 years. Although the Koalas are marsupials, they are often mistaken for bears. Koalas are said to be very lazy, but when it comes to getting food, they can climb 150 feet to the top of an Eucalyptus tree and leap from one to another. These "pouched animals" are very quick tempered and very muscular. The Aboriginal meaning of Koala is "no water." Koalas have the ability to drink, but they seldom do. They obtain their water through the eucalyptus leaves. Koalas are excellent swimmers. They are nocturnal, spending their days lounged in a tree and their nights consuming up to 2.5 pounds of eucalyptus leaves. The koalas communicate by a "bellow." Koalas are "arboreal", which means tree dwelling. This fact puts the lives of many Koalas in danger. Since Western colonization, 80% of the Koalas habitat has been destroyed. The remaining 20% is mostly privately owned. Urbanization is also cause for concern. Koalas are very territorial mammals. They do not wander around, they stay put. Although not the greatest threat, Chlamydia, a sexually transmitted bacteria, places strain on the Koala community. There are several strains that cause problems. Chlamydia pecorum and Chlamydia pneumoniae are two that are known to affect Koalas. Chlamydia psitacci is also said to cause problems for these furry animals. This strain can cause blindness, infertility, and other complications that can be fatal. Koalas under the stress of urbanization have widespread, serious problems. Queensland has one of the warmer climates in Australia. The Queensland Koalas have less fur than other Koalas. This adaptation helps them to survive in the heat. When I visited the Fort Worth Zoo, I immediately fell in love with these furry creatures. The koalas were very laid back and content. They seldom stirred from their nap. They slept in a curled fetal position on the branch of the tree. They were very easygoing, and did not mind all of the attention they were attracting. Thank you for visiting my page. I hope you have enjoyed it. Feel free to E-Mail me with any questions or comments.